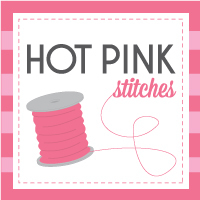 Hot Pink Stitches: My Sewing Room :: Updated! 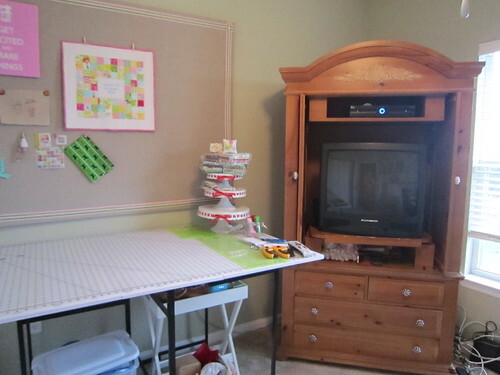 My Sewing Room :: Updated! It's no secret that I love taking a peek into other's creative havens to check out their setup and process. It's fun to see how other people lay things out and get inspiration from it. I recently updated my space with a couple of inspiration walls I made myself, and they have completely transformed my space. 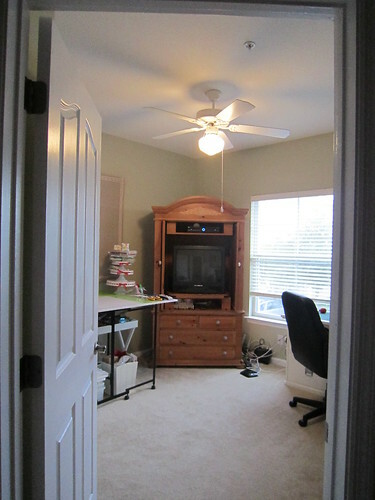 I actually featured my big sewing room update exactly a year ago, but oh how things have changed, yet again! This is the view from the hallway. Since I don't actually have space to install it on a wall, I've made it so it leans. There's actually another one behind it, as well. It's made from lightweight insulation "R-Mat" board you can find in the construction section at Home Depot. It's some type of foamy styrofoam, so it's really easy to move when needed, plus it also takes pins really well, in case I need to post lots of items, like the sashings you see up there now. I've been working on that LouLouThi quilt and actually spread out both boards against one wall so I could create the layout of the quilt. Then when I'm done, they can go back to their home here. Easy as that! That's the main work area, which has been greatly enhanced with the easy access design wall. 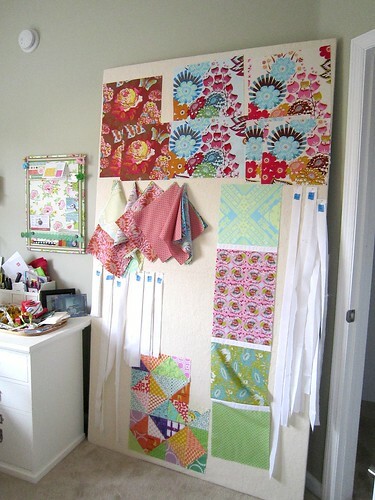 I used to have to keep all the "in-progress" blocks over there by the window, but now the new wall saves all that space! This little flowery board is also another new addition. I got one of those magnetic dry-erase boards from Wal-Mart for like $6, then wrapped and staple-gunned the fabric and ribbon. So easy and pretty! I always have on either trashy tv or a movie to keep me company. My dog, Seamus, also keeps me company. He usually hangs out over there by the window and looks out through that crack I keep open for him...I call it his "peeking spot." I was originally planning on just hanging stuff up on the wall, willy nilly, but then I didn't want all those holes in my wall. And since nobody makes what I wanted, and what I want is usually specific and detailed, I made my own! I took a 4' x 5' sheet of brown hard-board, then topped it with 2 layers of cork, available by the foot from a big roll at Home Depot. I attached all the layers using an industrial tube of all-purpose glue from the paint department. I then wrapped it in linen, framed it in my favorite combo of pink and green grosgrain ribbon, and stapled it all to the back. To hang it, I just installed a picture-wire kit to the back. It ended up being about $60, including all materials. Not bad! 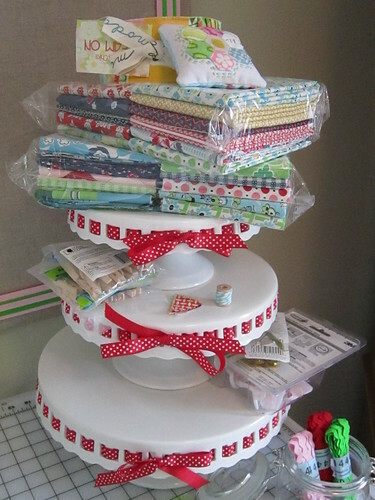 This is like my little shrine, cake stand tower. 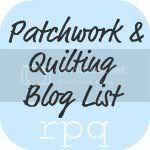 Up there right now I've got my 1/2 yards of DS Quilts, Dream On jelly roll, and the pincushion gorgeousness from Crystal and the Urban Home Goods Swap on Flickr. Thanks Crystal!!! The board! I keep adding things every day. 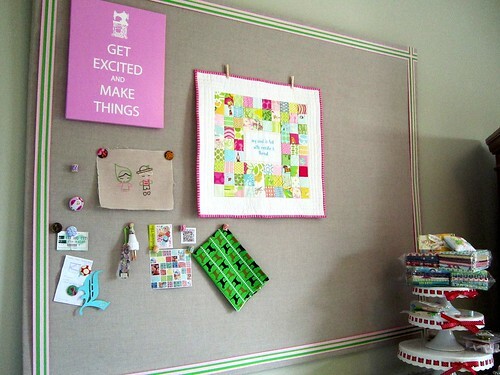 Pretty much the whole reason I needed an inspiration wall, to pay homage to this piece de resistance, the mini quilt from Crystal and the UHG Swap. 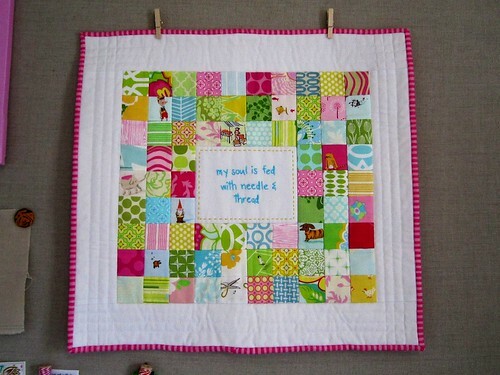 LOVE LOVE LOVEEEEEEEEE this quilt!!! She totally nailed it with the saying....I was like, my soul IS fed with needle and thread! It's safe to say it's on the short list of "if my house were on fire....."
Here you see my little clothespin doll from Liberty, a souvenir from my trip to London. I've also posted printouts of the quilt-alongs I'm currently in, minus Farmer's Wife and a couple of skill-builder ones. It helps me remember at a glance what the heck I'm up to! I also got the dog fabric b/c my baby, Seamus, is a black lab, so I'm sure I'll be making some great pins with this. 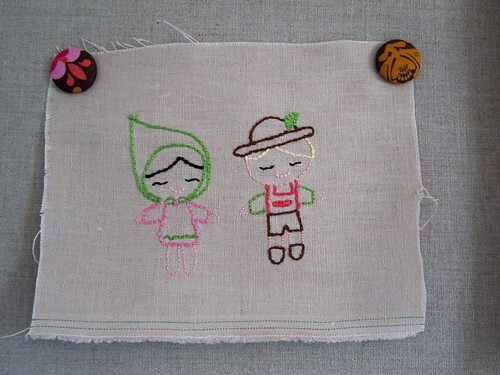 One of my first embroideries, just for fun. They look like Hansel & Gretel! This just underwent a teeny tiny organization, so it'll change, yet again, from this picture. Everything is labeled and in its place. Soooo helpful when you have this many craft supplies! Thanks everyone for checking out my sewing space! Okay, I admit I'm a tad bit jealous. That's a great space. I wish I had space. It's pretty cramped in our office. I do have a design wall, but it's a piece of felt tacked to the wall behind our elliptical. 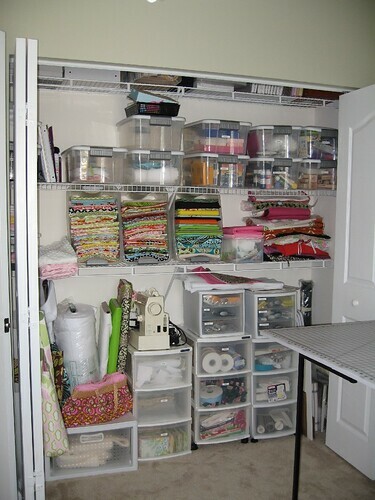 Someday I hope to have my very own sewing room! Your's looks great. 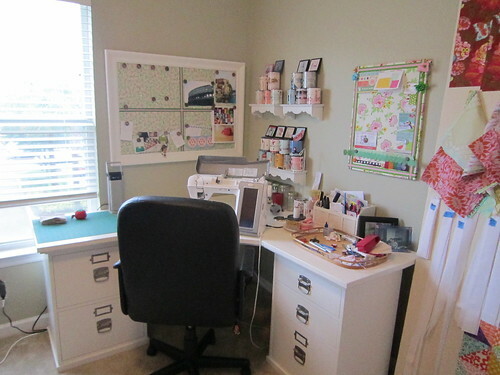 Wow beautiful sewing space! I would love to be that organised and tidy! LOVE it! Such fun seeing a peek of where you work and create. Makes me feel like I know you even better. I am envious of your closet space. Love the design boards! 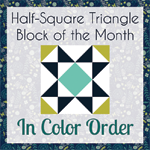 I saw your spotlight on Ellison Lane Quilts this morning. Love your blog! Can I ask a couple of questions? Did you cover the R-mat with batting? 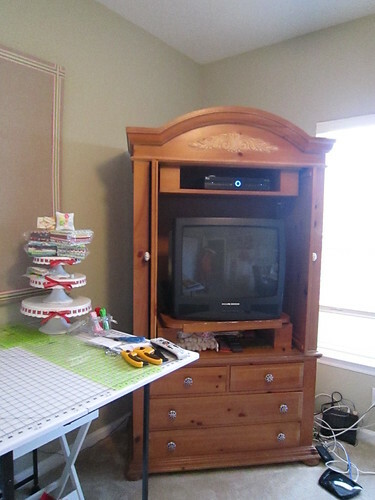 Also, where did you get the sewing desk that your machine sits on? How much did it cost? Thanks! I love a good nose! Thanks for sharing. 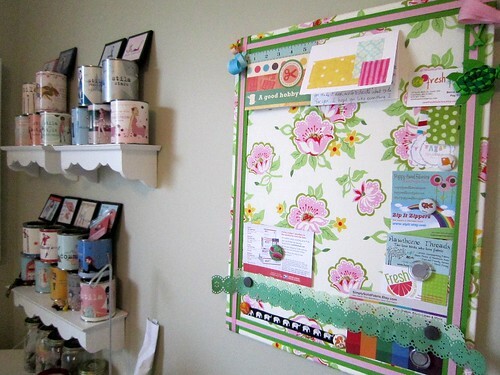 Oh my goodness this is literally the most inspiring craft space I have ever seen! 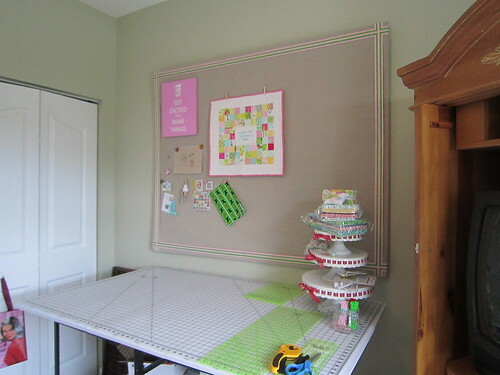 I thought my sewing space is getting pretty neat but after seeing yours I am so so soooooooo inspired to make fabric covered boards and attach pretty things like you do! Your sewing table looks so inviting! I could stay there all day long! OMG! Amazing! I just found your blog from the BQF & I am now following you and checking out previous posts....and needing to comment on all of them apparently! Too much to say about how I love what you've done with this room! Gorgeous!! I want a room like this too? Do you have plans to travel to Spain? Hahahahaha! 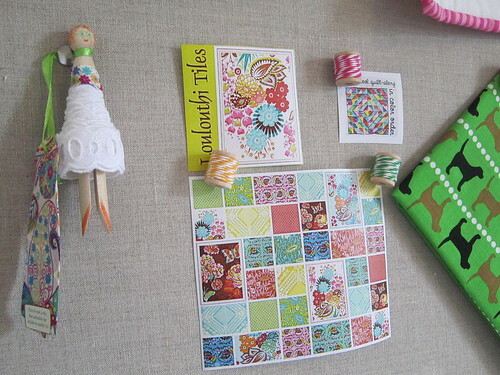 It is very refreshing to read your blog, and a great inspiration for me, thank you and please, keep posting and sewing! Love your space! Where did you get your cutting table? Thanks!